S.H.I.E.L.D. : The Complete Collection Omnibus (Marvel): Marvel is proud to present — in a single complete volume — one of comics’ most-innovative series! With international threats on the rise, Tony Stark and a council of global powers tapped Nick Fury to protect the US from Hydra, A.I.M., Baron Strucker, and the Yellow Claw. The greatest team in comics, Stan Lee and Jack Kirby, dove into the world of covert ops, mixing Cold War drama with the mighty Marvel manner. They set the tone, but when Steranko took over, he rewrote the entire rulebook. Steranko turned S.H.I.E.L.D. into one of the most visually innovative comic series ever published and every early story is presented in oversized glory. You’ve been granted Priority A-1 access, so reserve your copy today! Collecting the Nick Fury stories from Strange Tales (1951) #135-168, Nick Fury, Agent of S.H.I.E.L.D. (1968) #1-15, Fantastic Four (1961) #21, Tales of Suspense (1959) #78, Avengers (1963) #72, Marvel Spotlight (1971) #31 (which reveals an important Nick Fury secret! ), and material from Not Brand Echh (1967) #3, 8, and 11. Features work by Lee, Kirby, Steranko, Roy Thomas, Denny O’Neil, Archie Goodwin, Jim Starlin, Howard Chaykin, John Severin, Herb Trimpe, Don Heck, Barry Windsor-Smith, Sal Buscema, Joe Sinnott, and more. 960-page oversize color hardcover. 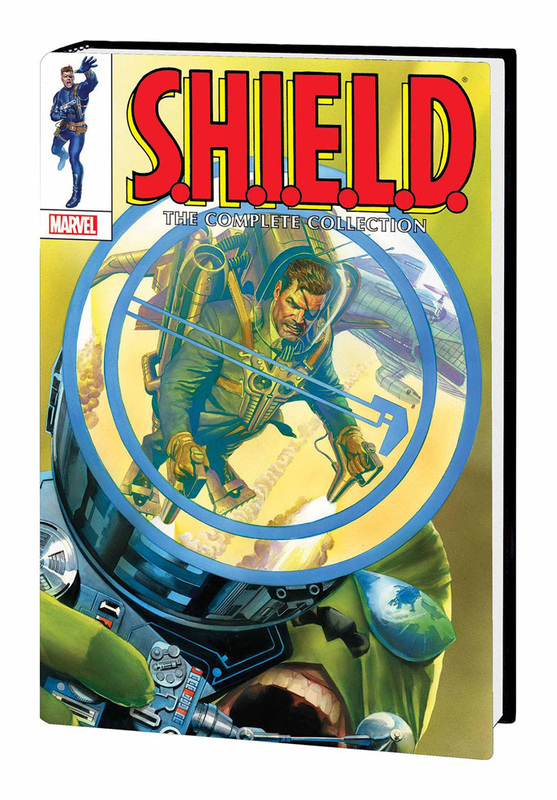 – Released in September 2015, in two versions, one with an Alex Ross cover and one with a Steranko cover. I like Alex Ross, but his cover for this book is underwhelming, clearly the Steranko cover is the one to get. And you’ll pay for it, as quantities on the Steranko version are climbing in price. But well worth the seeking out.